Reading entrails. Eww. How barbaric. Kind of a gross scene to start a Biblical epic with, yes? But at least an alien didn’t burst out of the dead bird’s chest! A clash of swords...a sign of things to come. The next time their swords clash, Moses will be banished from the kingdom. The rain of arrows is spectacular. The rest of the battle isn’t bad either. The confrontation definitely has a LOTR aesthetic and pace to it, but it isn’t nearly as protracted or flashy as the melees in Peter Jackson’s Middle Earth films. Moses visits the viceroy...insists on looking the slaves in the eye. Moses spares Breaking Bad’s #AaronPaul from the whip. Turns out that Paul’s character is named Joshua, the man who eventually succeeds Moses. Moses learns about his true identity from #SirBenKingsley. If Kingsley told me my dad was a hippo and my mother was a rhino I’d probably believe him. The man has gravitas. Moses looses one horse but gets two more. It’s almost as if someone up there is looking out for him. Of course, Moses had to slay two assassins in order to acquire the steeds. The Lord giveth and the Lord taketh away, I suppose. Most men would die to have such an easy path to pleasure. Just my luck, but whenever I try playing that game it always ends up being twenty questions. The burning bush sequence is very different, but very effective. If there’s any scene in the movie that will spark controversy, this is it. Moses’ mud bath and chat with a young boy is way out in left field compared to a traditional interpretation of the burning bush event in the Bible. Moses returns to Memphis...not the one in Tennessee. The locals say it’s nice this time of year, but maybe they’re just in d’Nile. Yuk, yuk. Ramesses watches his boats set ablaze by flaming arrows. A brilliant visual. These minor acts of rebellion are but pinpricks to the mighty Pharaoh. However, where human agency ends, God’s might begins. Prepare for the twelve plagues. Hmm...I never knew that crocodiles initiated the plagues. However, this feeding frenzy is a spectacular feat of CG wizardry…and is also pretty gruesome. Darkness falls over the city like an ashen shroud. Then the cries of terror ascend. Spine-tingling! Ironically, this “angel of death” visual is far less elaborate, from an FX standpoint, than the ones in many of the earlier Moses films. Though low-tech and fairly simple to achieve, this sequence is highly effective. The chariot pileup is awesome. You just knew Ramesses’ hubris would lead to this end. But it’s still a spectacular cataclysm. I couldn’t think of a third “T” word, but you get the point. Actually, they’re God’s people but since it’s such a great line, and because the actor moonlights as Batman, we’ll let it slide. Final analysis: a reverent treatment of the Biblical account with minor deviations from the text. 3 out of 4. Though more epic in scale, it still lacks the heart, and faith, of DeMille’s version. Though not as blatantly sacrilegious as Darren Aronofsky’s Noah (2014), Ridley Scott’s rendition of the exodus saga takes occasional liberties with the sacred text which will, undoubtedly, create a great deal of controversy among theological fundamentalists. There doesn’t seem to be a happy medium with these big screen Bible features—they’re either poorly produced but theologically accurate or lavishly produced but brimming with questionable creative departures or outright heretical story elements. In Exodus, you can tell that Scott’s intentions were to evince the appropriate degree of reverence toward the source material while making art with some selected story elements. Unfortunately, the results are a mixed bag. The major action sequences look like they were storyboarded by Peter Jackson or Steven Spielberg, which is to say they look amazing but are better suited to a blockbuster adventure film than a historical epic. Some of the movie’s major narrative turning points are radically different from what appears in the Bible; chief among them is the head-scratching burning bush episode. Still, the plagues play out pretty much as you’d expect them to (except for the croc crock) and the “death angel” scene stands out as a prime example of how, when it comes to FX, sometimes less is more. 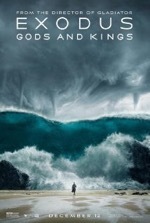 Just like in Noah (see my review) however, the divine is often explained away by human reasoning here: the “scientific” explanation of the plagues, the receding of the sea (with the addition of tornadoes just because they look really cool), etc. The characterization of Moses has also been altered for wider appeal since listening to Bale stutter his way through two and a half hours of dialog would’ve been a major detractor to the story’s enjoyment. Bale’s Moses is decisive, confident and heroic: the real Moses struggled to exhibit any of the above attributes and, as a result, had to rely upon God for his strength…which is a major point of emphasis throughout his character arc. As flawed as the patriarch’s portrayal is, Scott’s depiction of the Almighty is downright disturbing. Scott consistently paints God as an angry tyrant. Worse still, this God is revealed as a warmonger when He expresses how pathetically ineffective Moses’ acts of sedition have been and how more aggressive, i.e., supernatural, measures are required in order to bring the evil Pharaoh to his knees. Is this really Scott’s perception of God? If so, it certainly explains the movie’s authoritarian portrait of the Big Guy (Boy?) Upstairs. The forging of the Ten Commandments was a visual extravaganza in Cecil B. DeMille’s 1956 masterpiece, but, for whatever reason, Scott chose to eschew FX during this dramatic passage—the low key scene sees Moses chiseling the tablets himself while the mental apparition of God stands around and bickers with him. Judging by this scene, it would appear that Scott’s God is also a micromanaging taskmaster (or is just plain lazy). In the end, this film will go down as an entertaining examination of this exilic event, but it certainly won’t be esteemed as a faithful adaptation of the Biblical account. However, Exodus is an updated cinematic spectacle with modern visual effects and big name stars, so it serves its purpose as a sensational, yet superficial, survey of this standout Sunday school story. Gyllenhaal creates his own job as a freelancer. After striking out with two potential employers, Gyllenhaal decides to take matters into his own hands and forge his own job description. Gyllenhaal sees his “graphic” shooting clip on the news. A monster is created. The chance to become famous for filming gruesome images at accident sites is like crack cocaine to Gyllenhaal’s narcissistic opportunist. Gyllenhaal arrives late to a structure fire thanks to the ineptitude of his new intern. Don’t worry, Gyllenhaal will get him back later in the film. And how! Now that’s a significant upgrade in vehicles. Though, it’s not very inconspicuous is it? In the scene where Gyllenhaal flees the scene of the shooting, wouldn’t his flashy sports car draw the attention of cops responding to the emergency? As a getaway car, his original beater would’ve been better suited for flying under the radar…plus, with the way Gyllenhaal drives, why would you risk crashing that beautiful new vehicle? Gyllenhaal “sets the scene” at a car accident. Clearly he never took a first aid course, because you never move an injured individual at an accident site for fear of creating or exacerbating a neck injury. “A friend is a gift you give yourself.” Creepy! Gyllenhaal films the accident he created. Now that’s cold. Poor Bill Paxton didn’t know he was dealing with a nut job when he offered to partner with Gyllenhaal. Side note: Paxton played another adrenalin junkie in Twister (1996). However, the risk here is probably a little less and the pay is probably far better. It would be funny if this was an older version of the same character, who decided to settle down and get a respectable job after having his fill of chasing tornadoes. Capturing a shooting in progress. Now that’s an exclusive. This is a very grizzly sequence, especially in its original, non-blurred format. This sequence puts Gyllenhaal’s character on the map and also explodes the movie’s theme of ethics in media. Gyllenhaal sets up his own exclusive. A dangerous game. He uses cops as pawns in a scene that he’s created for his own amusement and professional advancement. Frightening! Filming a high speed chase from right behind the pursuing cop car. Crazy! You know this will be the next kick for those who like to live their life on the edge. Chasing tornadoes was so 90s. Final analysis: a telling, salient story of media sensationalism gone awry. Rating: 3 out of 4. A disturbing portrait of a troubled soul who finds his niche by capturing the shocking. “If it bleeds, it leads,” Bill Paxton’s character says as he walks, no…swaggers, away from the scene of an accident with video camera in tow, brushing right past Jake Gyllenhaal, who’s late to the scene. Too late, it turns out, to sell his footage to a news station, because when it comes to independent footage, as with life itself, the early bird gets the worm. Conversely, I suppose the late bird gets the night crawler. Appropriately, that’s the name (nightcrawler) for these thrill-seeking freelancers who listen to police scanners and try to beat emergency vehicles to the scene of an accident in order to provide (for a price) local news affiliates with exclusive footage of the catastrophe. As if that premise wasn’t intriguing enough, the movie boasts a compelling character study and some searing commentary on the condition of our society. 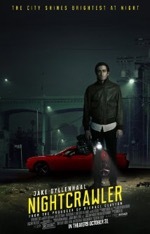 Gyllenhaal’s portrayal of a nightcrawler named Lou Bloom is undeniably brilliant—Bloom is a bundle of quirks and neuroses rather than just one idiosyncratic behavior, which seems to be all the rage in entertainment these days…especially on TV. To whit: Tony Shalhoub made the titular obsessive-compulsive detective famous on Monk, Claire Danes continues to astound as a bipolar CIA agent on Homeland and young Max Burkholder is masterful in his depiction of a preteen with Aspergers on Parenthood. The list goes on and on, but these clear-cut characters with easily diagnosable psychiatric conditions (even for a layman) often lead to predictable or caricatural enactments since the personality traits exhibited by such people are so distinctive and well-defined. Again, Gyllenhaal’s nuanced performance is utterly captivating because it adroitly avoids the obvious “Hey, guys, I’m playing an egomaniacal sociopath” telegraphing that frequently accompanies roles where attention is drawn to a character’s mental challenge or affliction. Acting aside, writer/director Dan Gilroy and cinematographer Robert Elswit do a superb job of capturing the distinctive look and mood of L.A., particularly during the night scenes. In many ways, Gilroy’s framing choices remind me of those in Nicolas Winding Refn’s Drive (2011), another nocturnal neo-noir that featured a generous portion of pulse-pounding racing through the city’s main arteries and side streets. As in Drive, the City of Angels serves as an additional, non-corporeal character in this film. I won’t belabor the movie’s not-so-subtle treatise on the current state of the news, but its message of morality (or lack thereof) in media is poignant, especially in light of the fact that many traditional news outlets have resorted to sensationalizing stories in order to compete with social media and online news sources. Sad to say, but traditional news just can’t satiate the appetite of a society that’s incessantly and exponentially drawn to the extreme, graphic and profane (all of which are shamelessly showcased and promulgated by YouTube videos, reality/late night/political commentary TV shows, etc) more than actual vetted and sourced journalism. At the time of this writing, HBO’s superb drama, The Newsroom, will air its final episode this weekend after three abbreviated seasons. As a show about a fictitious news network, The Newsroom never found a large enough audience to sustain a lengthy run, which is a profound disappointment since Aaron Sorkin’s topical, whip-smart drama is top shelf TV and deserved a better reception and fate than what it received. The characters on the show often express frustration over the fact that true journalism is being rapidly replaced by hack-on-a-corner reporting...after all, any idiot with a cell phone can capture or create the news these days. The grim reality we now face is that experienced and informed news anchors like The Newsroom’s Will McAvoy (Jeff Daniels) are becoming an endangered species, thanks to the Lou Bloom’s of the world. In a very real sense, these Joe Camcorders and late night creepers are holding the medium hostage. It’s enough to make your skin crawl.